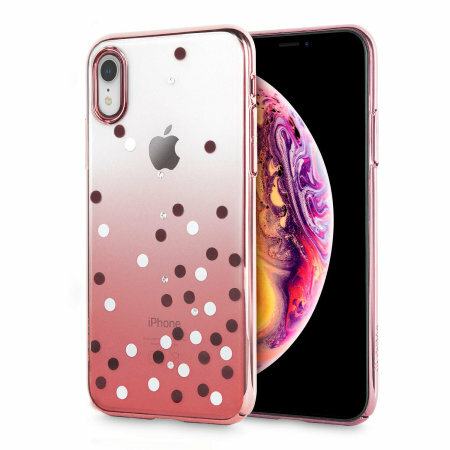 The unique polka 360 case in rose gold and clear is designed to provide a stylish complement to your iPhone XR. Featuring robust polycarbonate construction, anti-scratch coating and a blended spray design encrusted with Swarovski crystals. The Unique Polka 360 Shell case protects your iPhone from scratches and scrapes, while letting the beautiful design of your iPhone XR shine through. Comprised of a hard and durable polycarbonate shell, the Unique Polka case provides excellent protection with a hint of style and sophistication. Incorporated into each case are striking Swarovski crystals that sit upon a clear back panel to showcase the iPhone's original design. This truly adds a stylish accent to this fashionable case. The metallic elements in the design sit well with the metallic finish of your iPhone XR giving a classy overall aesthetic. This lightweight polycarbonate case provides excellent protection without adding any unnecessary bulk to your iPhone. This means that you will have no problems placing the phone in your pocket or handbag. It also means the iPhone XR's natural form is preserved as well as protected. Each Unique Polka 360 case has been designed specifically for the iPhone XR and features cut-outs for the various ports and features such as the rear facing camera. Please note: The item does not come with a screen protector, which can be purchased separately.